Travelling with a laptop is annoying. Take it out of your bag, ma'am. Please put it in the bin, ma'am. It must be by itself, ma'am. What if dedicated gadget pockets made that luggage juggle a little easier? That's the idea behind Incase's EO — a suitcase designed to make it a little easier to get a laptop from your house to wherever you're headed. 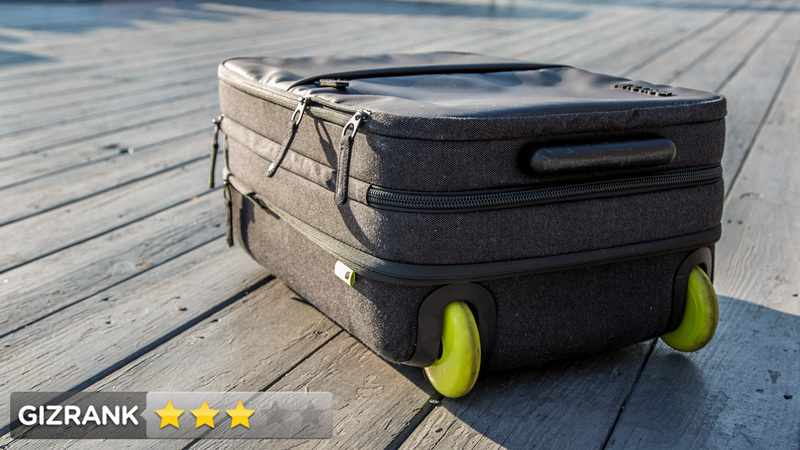 A small rolling suitcase for quick trips. Frequent travellers who don't leave home without their gadgets. It's a basic carry-on sized rolling bag, but with a soft, zippered laptop case and a pocket for your tablet in the front. Light, compact, with a cushioned telescoping handle and awesome bright green wheels. Expands 35% for extra storage. A cloth handle on the top and on the side make it easy to haul up stairs and heave into overhead compartments. Easy electronics access at airport security. The laptop and tablet store on the unprotected, soft, front side of the bag. If you checked the suitcase, they'd almost definitely get crushed in a toss onto the tarmac. 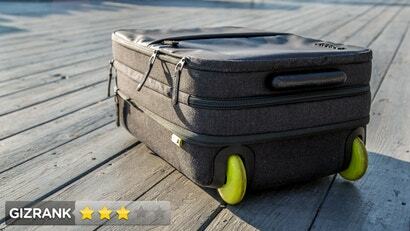 With minimal padding between the gadget pockets, you could imagine the suitcase stacked in a car, gadget-side down, beneath enough weight to let the gadgets crush each other. Meanwhile, two parallel handle rails take up crucial real estate inside the suitcase — it would be great if the luggage could use these rigid parts to protect the electronics. Unless you travel really light, it's too small for trips longer than a weekend. Navigated New York City streets and subways with this handsome thing for four days. Smooth wheels handled the pavement like a pro. Fit a 15-inch MacBook (handles a 17-incher too), along with chargers, a book, a few magazines and a change of clothes. This is a really stylish carry-on with convenient pockets for your gadgets. It's a little small to be your main suitcase. But there's no way I would check this bag with my laptop and/or tablet in the soft front pockets. Incase also has a hardshell roller in this collection. If I were looking for a bag to check, I'd try that one — I have a feeling that's the one I'd want to protect my MacBook while it bounced around in the belly of a plane.